Government officials responsible for emergency planning have met to discuss a possible “no-deal” Brexit, leaked documents reveal. 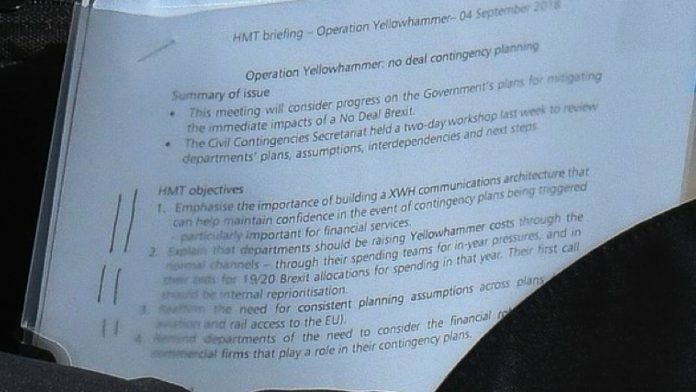 The disclosure was made in documents titled “Operation Yellowhammer: No-deal contingency planning”, photographed in the arms of an official. The papers state: “The Civil Contingencies Secretariat held a two-day workshop last week to review departments’ plans, assumptions, interdependencies and next steps”. The Civil Contingencies Secretariat is a Cabinet Office department responsible for emergency planning in the UK and has previously responded to flooding and foot and mouth disease.